No one ever told me that turning cookies into bars takes half the time and effort, and tastes just as excellent. You can see for yourself. 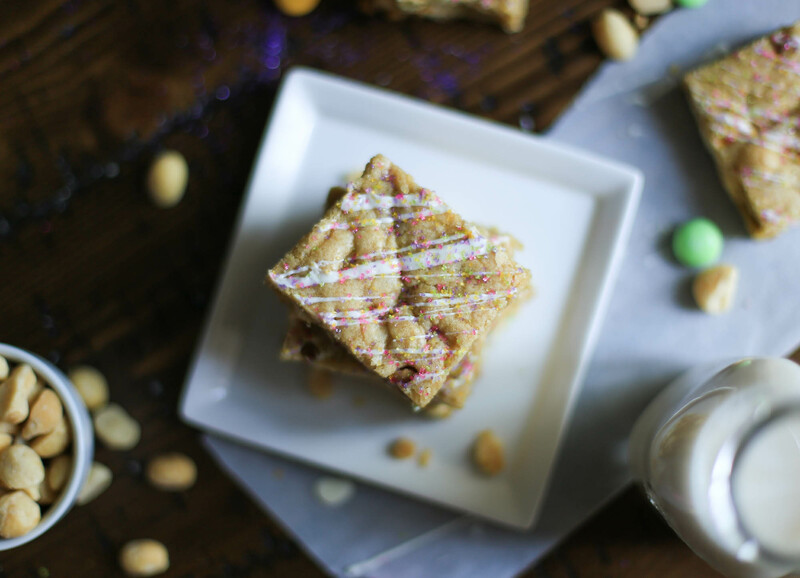 In today’s recipe, the simple, classic combination of white chocolate and macadamia nuts (one of my favorite cookie flavors) is made into bars. Everything is in one pan – baking, serving, and even storing. These buttery little morsels are sweet and salty, with chewy edges and a soft center. This combination, it is well with my soul. 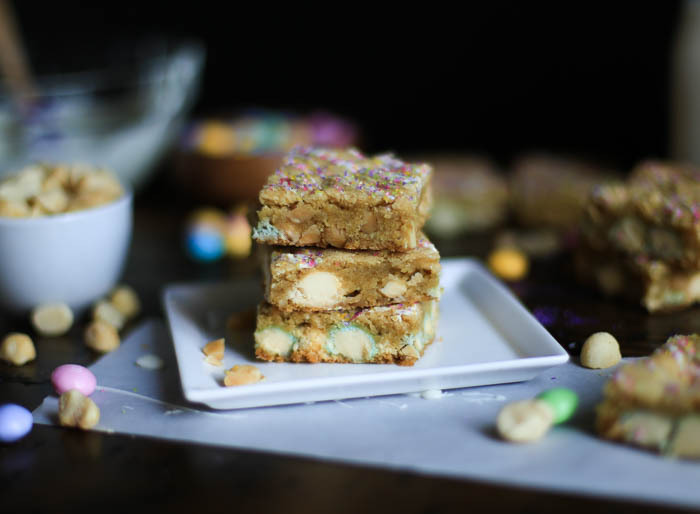 It’s easy to make these bars a bit more colorful, fun, and so on-theme with Easter by adding some pastel white chocolate M&Ms. Did you know they make white chocolate M&Ms?? I sure didn’t, but found mine at Target. Target loves me, this I know. Target goes crazy for Easter, perhaps because the holiday surpasses Halloween in candy sales, as I learned last year. But you can also use traditional white chocolate chips for this recipe if it just so happens to be, say, October and not Easter. In the Midwest, bars are a very popular item to bring to gatherings. More than cookies, I would say – perhaps because bars are baked in the pan, and transported in the pan, and cleanup is one pan. Most of my aunts have their own monogrammed pan, and in fact I also received one for my bridal shower. The pan very practically has my name etched into both the lid and the side of the pan so that one doesn’t get separated from the other. 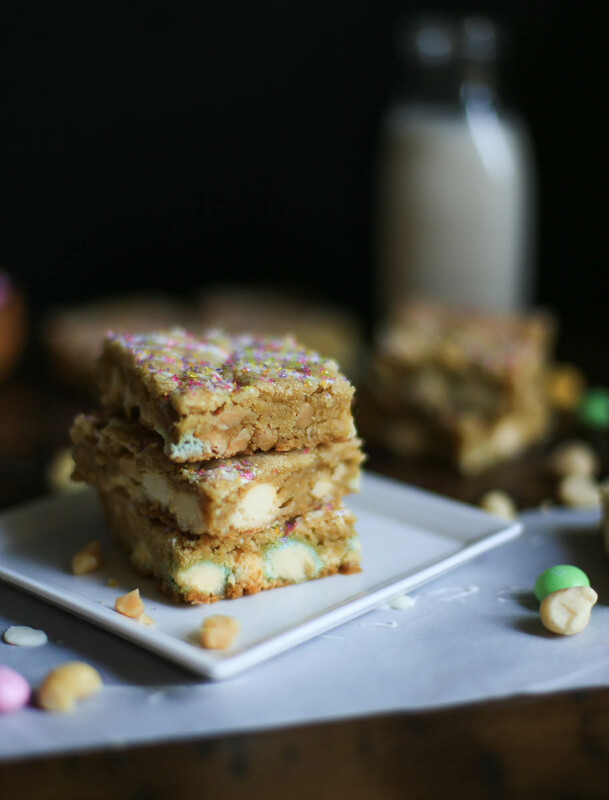 Here’s a new version of bars to try in these pans, just in time for Easter parties. Hallelujah. 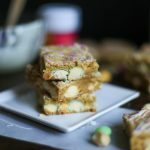 I actually found this recipe for macadamia nut bars in my “Best of the Best from Wisconsin Cookbook.” And yes, the book is as great as it sounds. The recipe is very easy, and the ingredients are all mixed in one bowl before being baked for about 30 minutes. Feel free to drizzle on even more white frosting than the photos show, too. Be not afraid. And with sprinkles, go crazy! Pastel sprinkles really add to the Easter theme. You can let the kids add the sprinkles, add different colors, anything. Let your cup runneth over with sprinkles. The bars are ready once the edges are golden. Even if the bars look a teeny bit pale in the middle, I suggest caution on the side of underbaking, because you don’t want to end up with hard bars. Drizzle on more chocolate (use a tiny bit of shortening to thin out the chocolate if necessary), and let cool before cutting into squares. Kinda like cookies, but in an easy-bake form! Mine eyes have seen the glory. Whether you call them blondies, blonde brownies, cookie bars, etc. this recipe makes a great indulgence for special occasions. And since not only Easter, but the many outdoor events of summer are fast approaching – bbqs, picnics, potlucks – it’s great to have an easy, crowd-pleasing recipe in your back pocket. Huge bonus points if you caught all six religious references in this post. Happy spring! Preheat the oven to 375 degrees F. Lightly grease a 9x9-inch or 11x7-inch baking pan. Using a hand blender, beat the butter on high speed in a large bowl until creamy, about one minute. Mix in the white and brown sugar until light and fluffy, about 2 minutes. Add the vanilla, salt, baking soda, and eggs. Mix well. Stir in the flour with a spatula until just incorporated; don't overmix. 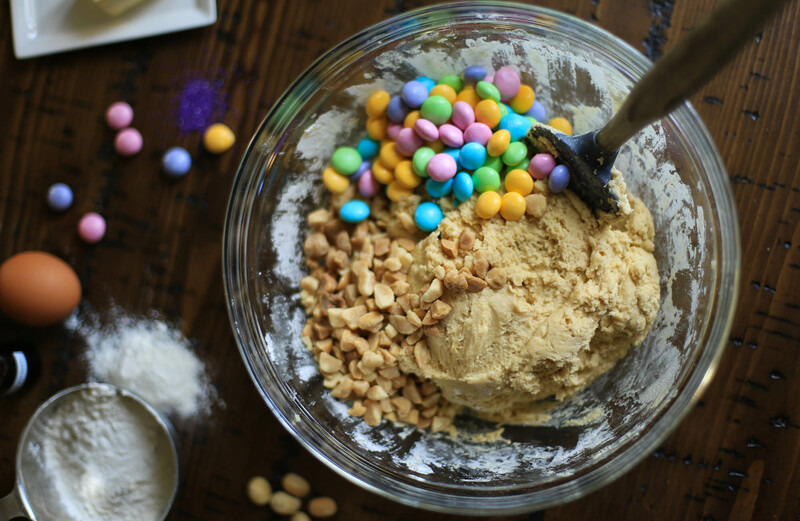 Gently stir in the macadamia nuts and white chocolate M&Ms. Spread the dough into an even layer in the prepared baking pan. Sprinkle with additional white chocolate M&Ms if desired. Bake for 25-30 minutes until the top is golden. Remove from the oven. To make the topping, melt the white chocolate chips in a glass bowl in the microwave with the shortening (the shortening is not required, it just helps to thin the chocolate). 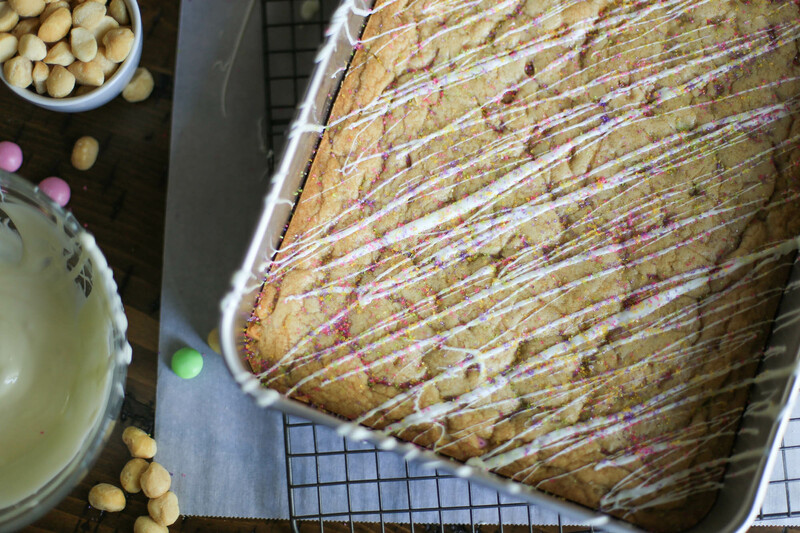 Use a spatula to drizzle the white chocolate over the bars. Decorate with sprinkles. Let cool completely before cutting into squares. You can place the bars in the refrigerator to cool more quickly if needed. The bars can be stored in an airtight container at room temperature for up to 5 days.